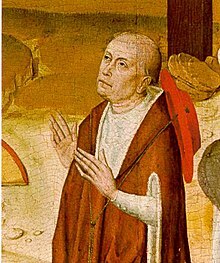 Nicholas of Cusa (1401 – 11 August 1464), also referred to as Nicholas of Kues and Nicolaus Cusanus (/kjuːˈseɪnəs/), was a German philosopher, theologian, jurist, and astronomer. One of the first German proponents of Renaissance humanism, he made spiritual and political contributions in European history. A notable example of this is his mystical or spiritual writings on "learned ignorance," as well as his participation in power struggles between Rome and the German states of the Holy Roman Empire. Nicholas of Cusa has remained an influential figure. In 2001, the sixth centennial of his birth was celebrated on four continents and commemorated by publications on his life and work. Nicholas was born in Kues (Latinized as "Cusa") in southwestern Germany. He was the second of four children of Johan Krebs (or Cryfftz) and Katherina Roemer. His father was "a prosperous boat owner and ferryman." 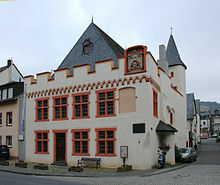 He entered the Faculty of Arts of the Heidelberg University in 1416 as "a cleric of the Diocese of Trier", studying the liberal arts. He seemed to have left Heidelberg soon afterwards, as he received his doctorate in canon law from the University of Padua in 1423. In Padua, he met with the later cardinals Julian Cesarini and Domenico Capranica and became friends with the mathematician Paolo dal Pozzo Toscanelli. Afterwards, he entered the University of Cologne in 1425 as "a doctor of canon law," which he appears to have both taught and practiced there. In Cologne, he made friends with the scholastic theologian Heymeric de Campo. Initially as conciliarist, Nicholas approached his university friend Cardinal Julian Cesarini, who had tried to reconcile pope and council, combining reform and hierarchic order. Nicholas supported transfer of the council to Italy to meet with the Greeks, who needed aid against the Ottoman Turks. He arbitrated in the conflict with the Hussites. Between the summer of 1437 and early 1438 he was a member of the delegation sent to Constantinople with the pope's approval to bring back the Byzantine emperor and his representatives to the papally summoned Council of Florence of 1439, which was attempting to bring the Eastern Orthodox Church into union with the Western Catholic Church. The reunion achieved at this conference turned out to be very brief. Nicholas would later claim (in the postfaced dedicatory letter of On Learned Ignorance, which Nicholas finished writing on 12 February 1440) that he had chosen to write on this metaphysical topic because of a shipboard experience of divine illumination while on the ship returning from this mission to Constantinople. He died at Todi in Umbria on 11 August 1464. Sigmund's capitulation came a few days after Nicholas's death. Nicholas was widely read, and his works were published in the sixteenth century in both Paris and Basel. Sixteenth-century French scholars, including Jacques Lefèvre d'Étaples and Charles de Bovelles, cited him. Lefèvre even edited the Paris 1514 Opera. Nonetheless, there was no Cusan school, and his works were largely unknown until the nineteenth century, though Giordano Bruno quoted him, while some thinkers, like Gottfried Leibniz, were thought to have been influenced by him. Neo-Kantian scholars began studying Nicholas in the nineteenth century, and new editions were begun by the Heidelberger Akademie der Wissenschaften in the 1930s and published by Felix Meiner Verlag. In the early twentieth century, he was hailed as the 'first modern thinker', and much debate since then has centered around the question whether he should be seen as essentially a medieval or Renaissance figure. Societies and centers dedicated to Cusanus can be found in Argentina, Japan, Germany, Italy and the United States. His well known quote about the infinity of the universe is found paraphrased in the Central Holy Book of the Thelemites, The Book of the Law, which was "received" from the Angel Aiwass by Aleister Crowley in Cairo in April 1904. " In the sphere I am everywhere the centre, as she, the circumference, is nowhere found". In The Pursuit of God (1948), A.W. Tozer refers to Nicholas as someone who had a vibrant Christian spirituality, stating in Chapter 7, "I should like to say more about this old man of God. He is not much known today anywhere among Christian believers, and among current Fundamentalists he is known not at all. I feel that we could gain much from a little acquaintance with men of his spiritual flavor and the school of Christian thought which they represent…"
^ Sophia Howlett, Marsilio Ficino and His World, Springer, 2016, p. 42. ^ Izbicki, Thomas M. (Spring 2007). "Cusanus: The Legacy of Learned Ignorance". Renaissance Quarterly. ^ Hagen, J. (1911). "Nicholas of Cusa". The Catholic Encyclopedia. 11. Robert Appleton Company. Retrieved 2008-10-13. This page was last edited on 13 March 2019, at 18:20 (UTC).